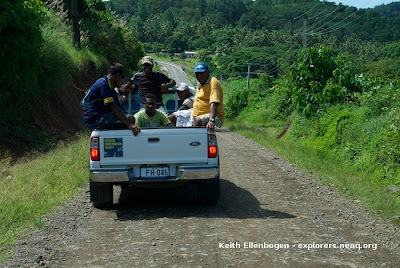 This is a guest post from Dr. Stacy Jupiter, Program Director for the Wildlife Conservation Society in Fiji. 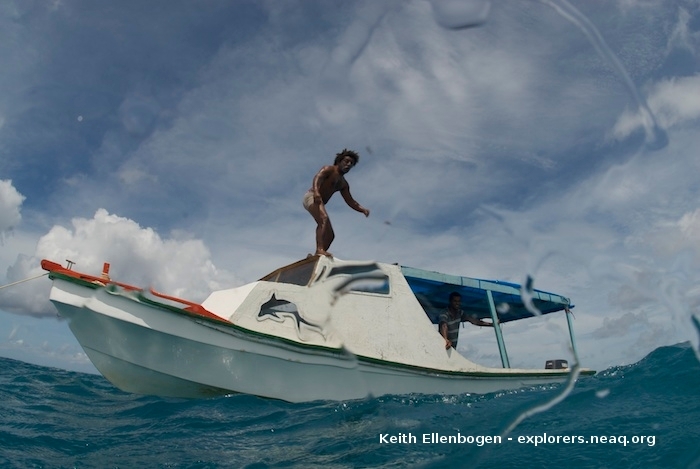 The photos are by frequent Global Explorers Blog contributor Keith Ellenbogen. 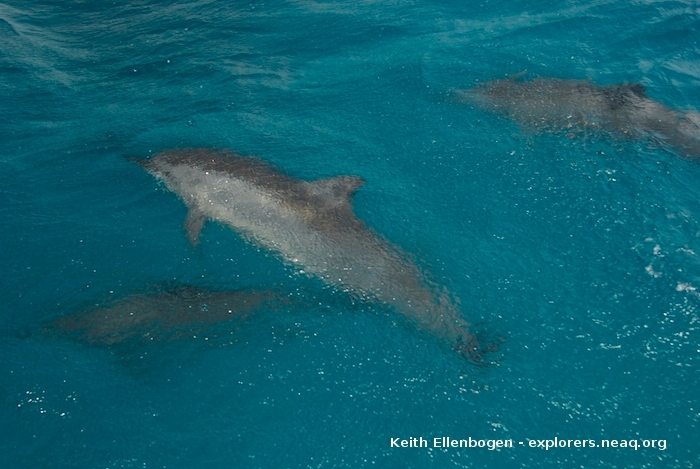 Keith and I were headed to Moon Reef, home to at least two resident groups of spinner dolphin (Stenella longirostris). It was late. We were hungry. And we had no idea where we were. It was pitch black and we were being pitched forward and backward over ruts, holes and bumps along the four-wheel drive track that could hardly even be considered a cow path let alone a road. In the midst of repacking cables, chargers, cameras, hard drives, plugs and dive gear, we lost track of time and the sun set long before we could reach our destination. I stopped to offer a lift to a young pregnant mother of three guiding her barefoot brood and to ask directions. We seemed to be going the right way, but without street lights, moonlight or signage, it was near impossible to tell. After finally deciding we had gone too far, we backtracked and finally found the sign to Natalei Ecolodge. "Does anyone here know Jay?" I asked a group of young Fijian men sitting on a stoop carving wooden combs. 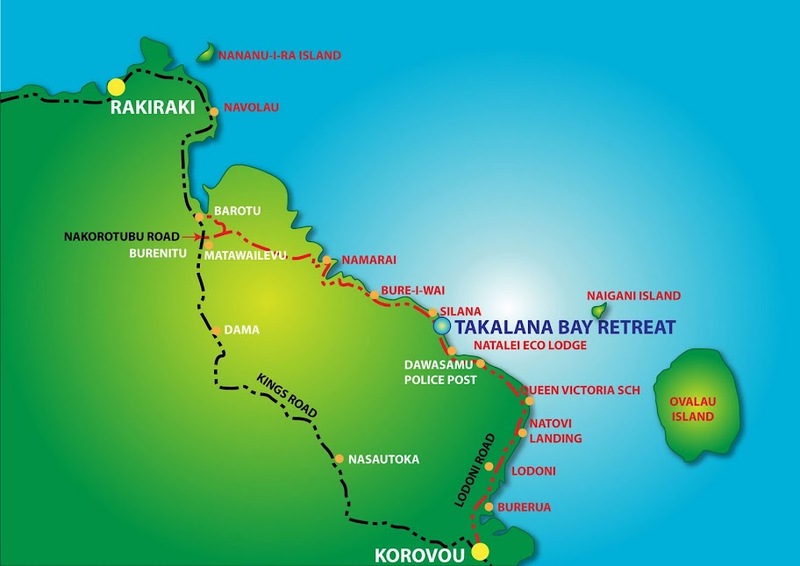 "We're trying to find Takalana and we're lost." They put us in touch with Jay Bau, who runs both Takalana Retreat and the Natalei Ecolodge situated between Nataleira and Silana villages in Tailevu Province of Viti Levu. He and his sister cater for intrepid researchers, photographers and travelers wanting to get a close look at the spinner dolphins. It is quite rare to see dolphin in shallow, coral reef waters. 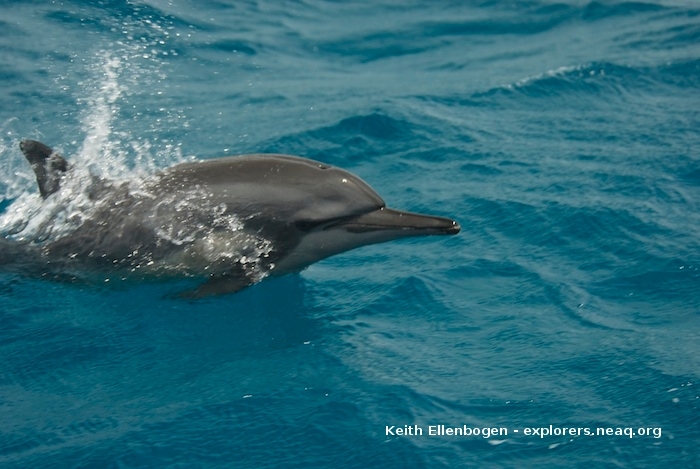 Research led by Dr. Cara Miller of the Whale and Dolphin Conservation Society and Flinders University suggests that the spinner dolphins forage for food in the deeper oceanic waters at night and come to the sheltered lagoon of Moon Reef to rest during the day. On average, there are at least 31 dolphins resting in the lagoon on any given day, as measured by Timothy Hunt, a student of Dr. Miller's. We awoke in the morning to gusting winds, blinding rain and frigate birds on the horizon, which for mariners have often signalled more bad weather to come. Yet, we had not travelled all this way to be thwarted by a little chop and swell. Jay took Keith and I out to the reef to get an up close look at the dolphins. To everyone's great pleasure, the clouds lifted soon after we pulled into the lagoon. 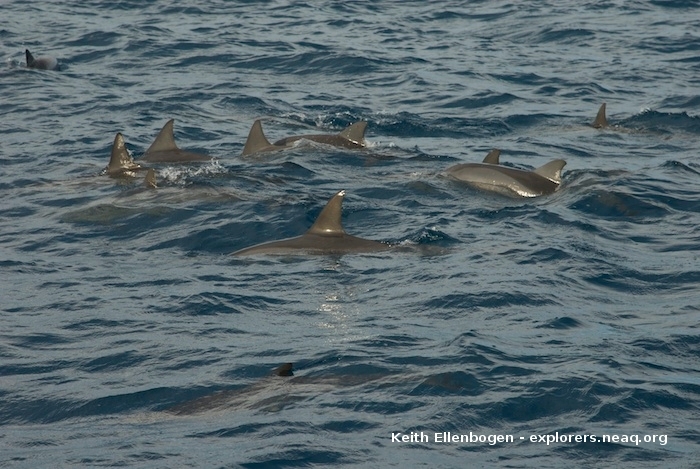 As we picked up speed, the dolphins came towards the bow, playing in its wake. Every once in a while one of us would give a loud whoop as off in the horizon we caught a glimpse of one of the breathtaking creatures breaking the surface to twirl in its characteristic spin. Much more research still needs to be done about just why the dolphins have chosen Moon Reef as their resting location. By understanding the links between habitat and dolphin behavior, we can we better identify areas for cetacean protection and management across all of Fiji and the region. In the meantime, we will encourage the local communities to designate Moon Reef as a protected area while promoting dolphin-viewing as an ecotourism venture that provides jobs and income for local residents.